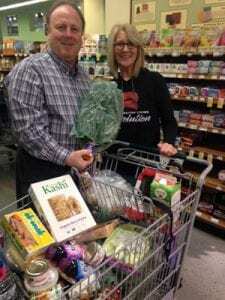 Bill is The Whole Food Health Coach client in the Spotlight. He is the single most dedicated, strong, focused man I have ever had the pleasure of coaching. His precious wife is by his side at all our sessions. Bill is determined to lose the 100lbs., and save his life. He is working out faithfully and he is following a heart-healthy regimen of tasty, nutritious quality foods to support his health and fitness goals. 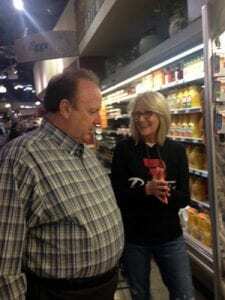 Bill began Phase 1 with a Smart Shopping Trip (photos) and 6 sessions to train his body and will soon begin Phase 2. I love our weekly sessions because Bill has a terrific sense of humor and I know he will make me laugh! Also, I know he has been working hard on his Lifestyle, Exercise, Attitude, and Nutrition all week. We have been working together for maybe a week or so, and we went shopping on Monday. Last night, Tuesday, I made your 3-2-1 salmon recipe for my family of 3 young girls and hubby. None, of which, have ever had salmon they liked! My girls were very scared and my hubby said he would at least try it…for the sake of the girls! Well, to ALL of our surprise, we all LOVED IT! The recipe was so easy, as are all that we have made so far, and we are having a great time learning and exploring new foods. Avery, my oldest, referred to you as the Chopped show saying you were coming up with all healthy baskets and it’s our job to make the yummy food! My 2 year old ate salad for the first time ever, and we all love the goat cheese, crackers, and honey! My hubby is eating avocado, with the peach salsa….something he’s never done before despite being Hispanic! Our girls cheer every night around dinner time…”THANK YOU MISS STEPHANIE! !” and we are only beginning!!! My biggest challenge….SUGAR….has officially been conquered. Today was iced coffee with ONLY Stevia Extract for sweetener. That was my defining moment! We can’t wait to see what else you have in store for us, including more homework!!! 🙂 Thank you from the bottom of my heart for changing our lives and helping this advertiser’s dream family transition into healthy eaters!!!! Crystal and the Happy Family! Stephanie, I want to say thank you for showing me a whole new way of looking at nutrition and eating healthy that tastes fabulous! These learning sessions have been valuable to my weight loss journey and glad you make them interesting as well as fun. Single HCM Professional trying to simplify my life by living healthy and staying fit. After attending the LEAN Essentials class I became more aware of the nutritional importance of fiber and protein in my diet. I had always heard those were important elements to a balanced diet, but I did not have the knowledge of how much or what formula to use. Stephanie’s class helped me become more informed of how to read labels and choose items that lessen sugar intake and increase fiber and protein. She also provided a strategy for meal preparation that helped ensure each meal is properly balanced. I think the LEAN Essentials class is a good way to jumpstart changes to one’s mindset about healthier eating. When we began our journey with Stephanie I was skeptical towards the investment. However, I worked out regularly but I was frustrated by the improvement in both my weight and my personal lab results. So I knew I had to do something different. We met with Stephanie and I knew then that I was going to learn what I needed to in order to make “life changes”, not just my weight. So for the next eight weeks we (my wife and I) were diligent about following Stephanie’s coaching and the results have been well worth it. We have lost weight, we do feel better and most important, we now understand what we need to do for the long-term, not just these eight weeks. Thank you Stephanie. I’ve shared my experience with many others. Stephanie has been a wonderful health coach who truly loves what she does. Eight weeks ago my husband and I began our “Clean eating” journey and we learned so much more than we thought. Of course, you think you know it all and that you are doing the right things, NOT! Stephanie’s guidance and training has changed our lives, combined, we lost over 30 lbs, we feel great and have more energy. We are now on our way to a healthier “US”! Thank you Stephanie! !